RODELAS, Brazil, Sep 30 2017 (IPS) - The Tuxá indigenous people had lived for centuries in the north of the Brazilian state of Bahia, on the banks of the São Francisco River. But in 1988 their territory was flooded by the Itaparica hydropower plant, and since then they have become landless. Their roots are now buried under the waters of the reservoir. After three decades of living with other local people, the Tuxás stopped wearing their native clothes, although for special occasions and rituals they put on their “cocares” (traditional feather headdresses). They welcomed IPS with a “toré” – a collective dance open to outsiders. Another religious ceremony, “the particular”, is reserved for members of the community. That is how they honour the “enchanted”, their spirits or reincarnated ancestors. But they are also Catholics and very devoted to Saint John the Baptist, patron saint of Rodelas, which was named after Captain Francisco Rodelas, considered the first chief who fought alongside the Portuguese against the Dutch occupation of northeast Brazil in the 17th century. Armando Apaká Caramuru Tuxá is a “pajé” – guardian of the Tuxá traditions. “The waters covered the land where our ancestors lived. Many times I saw my grandfather sitting at the foot of a jua (Ziziphus joazeiro, a tree typical of the eco-region of the semi-arid Northeast), there on the island talking to them up there (in the sky),” he said. “We lost all that. That place which was sacred to us was submerged under water,” he said, sadly. The Tuxá people, who for centuries were fishermen, hunters, gatherers and farmers, practically gave up their subsistence crops in their new location. Some bought small parcels of land and grow cash crops, such as coconuts. “We need to improve our quality of life. Before we used to live on what we produced from agriculture and fishing. Today that is not possible, so we want to return to agriculture, and to do that we need our land,” Chief Uilton Tuxá told IPS. 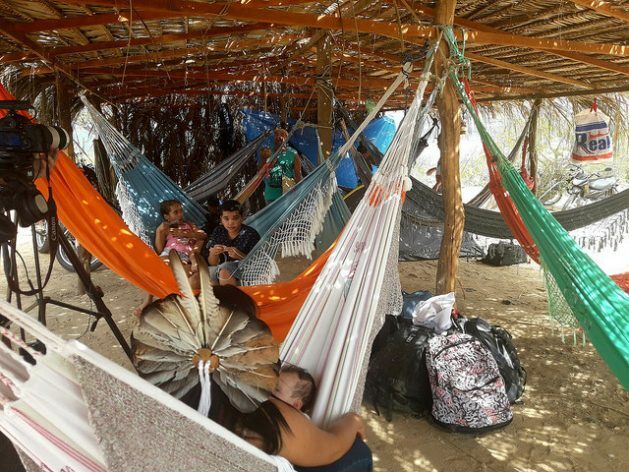 In 2014, a decree declared some 4,392 hectares of land an “area of social interest” in order to expropriate it and transfer it to the Tuxá people. a new compensation to be paid to the Tuxá people. But distrustful of the state bureaucracy and the courts, the Tuxá people decided to occupy Surubabel, the area near their village, on the banks of the reservoir, which was expropriated in order for it to be demarcated in their favor, but this never happened. They began to build a new village there, in what they call “the recovery” of their lands. “The occupation of this land by us, the Tuxá people, represents the rekindling of the flame of our identity as an indigenous people native to this riverbank. We were already here, since the beginning of the colonization process, even in the 16th century when the first catechists arrived,” argued Uilton Tuxá. “We want to build this small village for the government to fulfill its obligations and the order to delimit our territory,” he said. During the week they have other activities. They are public employees or work on their plots of land. But on Saturdays they load their tools in their vehicles and build their houses in the traditional way. “Nowadays a lot of land in this sacred territory of the Tuxás is being invaded by non-indigenous people and also by indigenous people from other ethnic groups,” chief Xirlene Liliana Xurichana Tuxá told IPS. “We were the first indigenous people from the Northeast to be recognized and we are the last to have the right to our land. This is just the beginning. If the justice system does not grant us our right to continue the dialogue, we will adopt forceful measures, we will mobilise. We are tired of being the good guys,” she warned, speaking as a community leader. Meanwhile, the small portion of their ancestral land that was not submerged, and the land they occupy now, are threatened by new megaprojects. These lands were left in the middle of two canals, on the north axis of the diversion of the São Francisco River, a project that is still under construction, which is to supply 12 million people with water. “The Tuxá people have suffered impacts, above and beyond the dam. 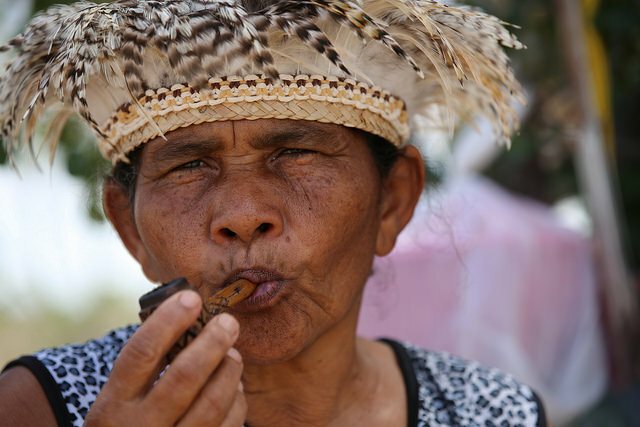 There is also the diversion of the river and the possibility that they might build a nuclear plant will also affect us,” said Uilton Tuxá, smoking his marakú during a break. They say the marakú attracts protective forces. And this time they hope these forces will help them to get the land promised to them when their ancestral land was taken away, and that they will not lose it again to new megaprojects.